OTTAWA, Nov. 23, 2018 /CNW/ – Plastic pollution is a major global challenge for the health of our oceans, lakes, and rivers. That’s why Prime Minister Justin Trudeau launched the international Ocean Plastics Charter, in June, and has made ocean health and plastic pollution a priority for Canada’s 2018 G7 presidency. If we don’t act now, plastics in our oceans could weigh more than fish by 2050. With thousands of communities, jobs, ecosystems, and wildlife that depend on our oceans, lakes, and rivers, the Government of Canada is taking significant action at home and abroad to beat plastic pollution. Today, the Minister of Environment and Climate Change, Catherine McKenna, was joined by her provincial and territorial counterparts via teleconference for the annual meeting of the Canadian Council of Ministers of the Environment. Building on the strong momentum from Canada’s G7 presidency, federal, provincial, and territorial environment ministers agreed to push forward on a Canada-wide zero-plastic-waste strategy. 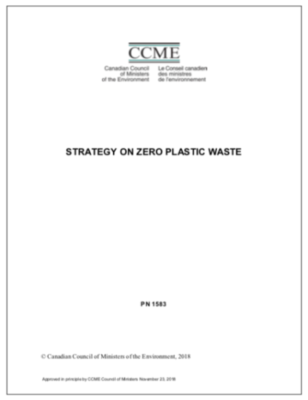 The strategy outlines a vision to keep plastics in the economy and out of the environment through solutions to better prevent, reduce, reuse, and clean up plastic waste. In 2014, every Canadian threw away on average 706 kg of waste. The Canada-wide aspirational waste-reduction goal adopted today by ministers will reduce this number by 30 per cent per person by 2030, with a 50 per cent reduction goal by 2040. This goal will not only help protect the environment, our air, and our waterways, but it could also generate more than 85,000 good middle-class jobs and $4.2 billion in GDP by 2040. It could also reduce greenhouse gas emissions by more than 15 million tonnes. During the meeting, ministers also approved in principle a renewed memorandum of understanding for mutual aid for environmental emergencies. The Council continues to support collaborative work on shared environmental priorities, including air and water quality, climate change, and cumulative effects. Canada will continue to take on leadership internationally and domestically with provincial and territorial partners to ensure our country can benefit from clean air, clean water, and clean nature and ensure a healthy and prosperous future for our kids and grandkids. Minister McKenna has served as president of the Council since November 2017. The Government of Canada wishes Nova Scotia well as incoming president of the Canadian Council of Ministers of the Environment for 2019. Plastic pollution doesn’t know any borders. That’s why it’s so important that we tackle this problem together. We made important progress today with provinces and territories to protect our oceans and reduce plastic pollution in Canada. With the longest coastline in the world and thousands of communities and wildlife that depend on our oceans, lakes and rivers, we need to beat plastic pollution together to ensure a healthy and prosperous future for our kids and grandkids. The Canadian Council of Ministers of the Environment is the primary minister-led intergovernmental forum for collective action on environmental issues of national and international concern. The Council seeks to achieve positive environmental results, focusing on issues that are Canada-wide in scope and that require collective attention. Putting forward the Ocean Plastics Charter at the G7 in Charlevoix, in June 2018, which has more than 27 signatories to date. Investing $65 million for plastic-waste solutions in developing countries through the World Bank and $6 million for innovative private-public partnerships through the World Economic Forum’s Global Plastic Action Partnership. Working with G7 members to establish a G7 innovation challenge to address marine plastic litter. The challenge is designed to spark innovation to beat plastic pollution. Canada pledged $20 million to support the initiative abroad as well as over $12 million for funding Canadian innovations. Setting a goal of diverting at least 75 per cent of plastic waste and eliminating unnecessary single-use plastics from government operations by 2030 and procuring more sustainable plastic products. Developing regulations to protect the environment by reducing the quantity of plastic microbeads entering Canadian freshwater and marine ecosystems. As of July 1, 2018, the manufacture and import of all toiletries that contain plastic microbeads, such as bath and body products, are prohibited, with a complete ban by July 1, 2019. Investing in waste and wastewater infrastructure through the Investing in Canada Plan to prevent debris from entering the environment. Over 1,400 water and wastewater systems have been repaired or built to date under this plan, improving the health of both our waterways and Canadians living in those communities.